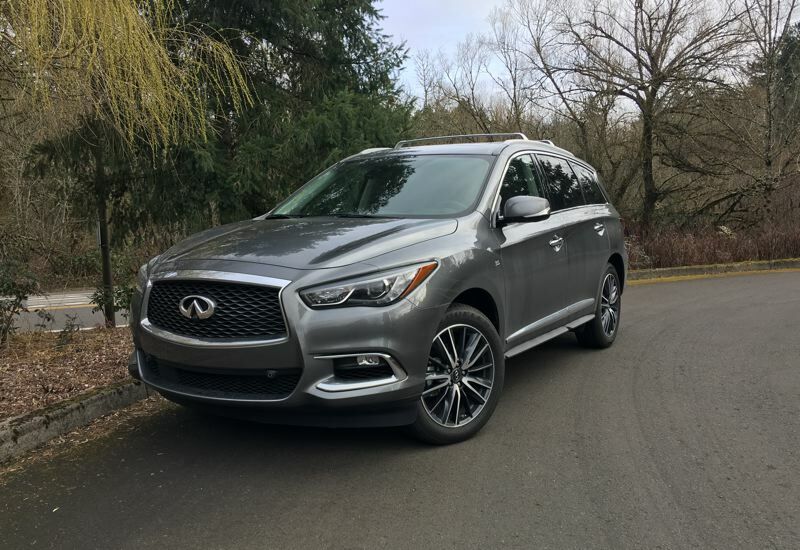 The bottom line on the QX60 is that if you're looking for a luxury SUV that will get you through any Portland winter, Infiniti is a solid choice. The mid-size SUV market is all about moving people and cargo efficiently, and if you're shopping in the luxury mid-size SUV market, it's also about comfort and performance. You'll get all of that in the Infiniti QX60, plus some very good winter driving features. I felt fortunate to be able to test the QX60 during our recent spate of February snow, because Infiniti has optimized their Intelligent All-Wheel-Drive system for winter driving. The 3.5-liter direct-injected V6 engine puts out 295 horsepower and 270 pound-feet of torque, which can easily overwhelm traction in the snow if it's not managed. But Infiniti also equips the QX60 with a continuously variable transmission that can step down the torque to get the QX60 moving, even on Portland's occasionally steep hills. You control the QX60 AWD system with a dial on the console. You've got normal driving mode, eco mode for fuel economy, sport mode for summertime driving, and snow mode. I spent a lot of time in Snow mode last week. When you select for snow, the QX60 automatically reduces power when you move out from a standing start. It feels strange at first, like the QX60 doesn't want to move too fast, but what it's doing is engaging all the wheels with low torque to get you started. Once you're going, the QX60 increases power, but always makes traction the priority. When the roads are clear, just switch back to Normal mode for regular driving. 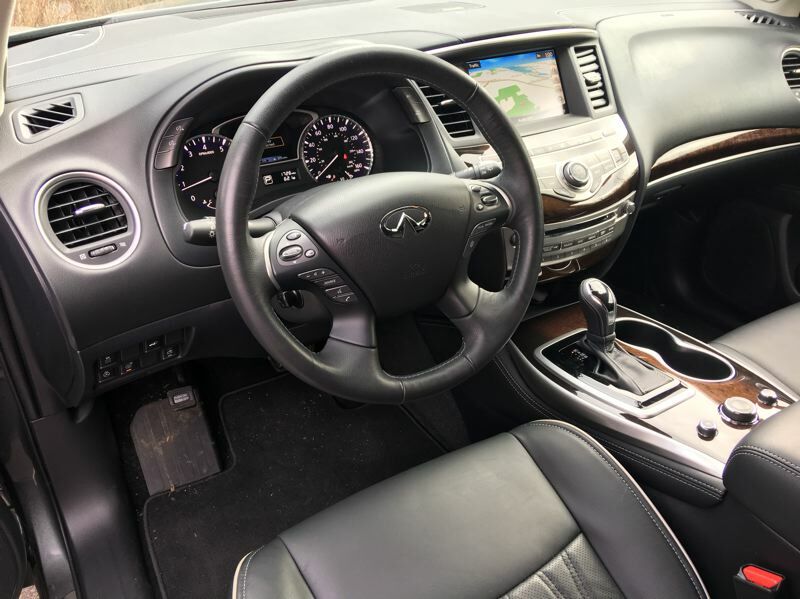 Inside, the QX60 delivers all the luxury and tech features you expect from an Infiniti. 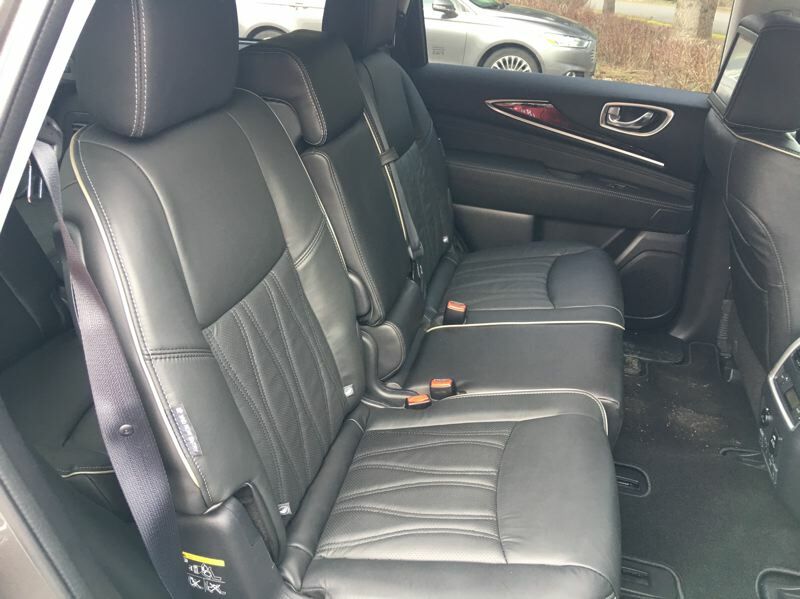 You get leather-upholstered seating for seven passengers in three rows, with a convenient fold-forward second row split bench seat that provides easy access to the back row. You get a generous 16 cubic feet of cargo space behind the third row, and 40.5 cubic feet with the third row folded down. 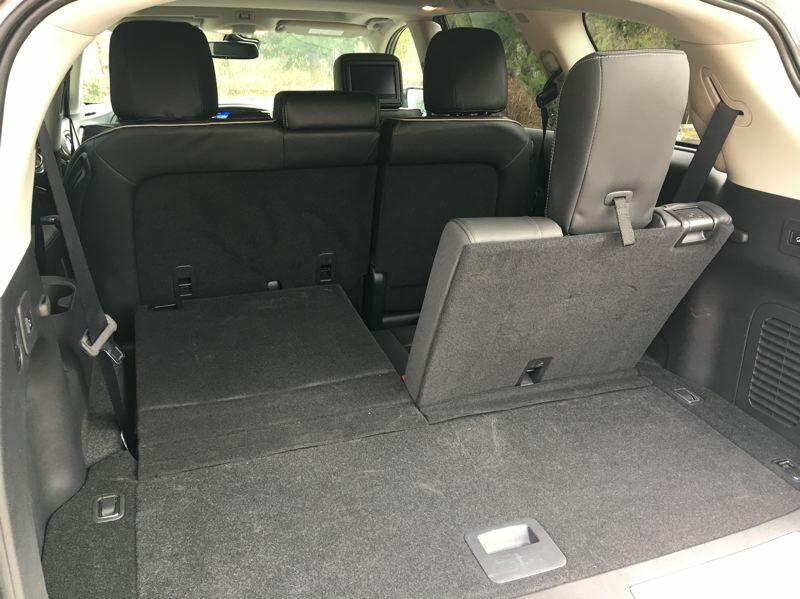 With all the rear seats down, you can put 76.2 cubic feet of stuff behind the first row. If you buy the Deluxe Technology package the front seats are both heated and ventilated, and the two outboard second row seats are heated. This package also includes a steering wheel heater, which is very nice in cold weather. The Deluxe Tech package also includes a Bose audio system, adaptive cruise control, and all the advanced safety gear known to the automotive industry. This option makes the QX60 a state-of-the-art SUV. You can also get an in-car theater package and a premium navigation package.